This post doesn’t need too much of an introduction, so we’ll just paddle right into it. 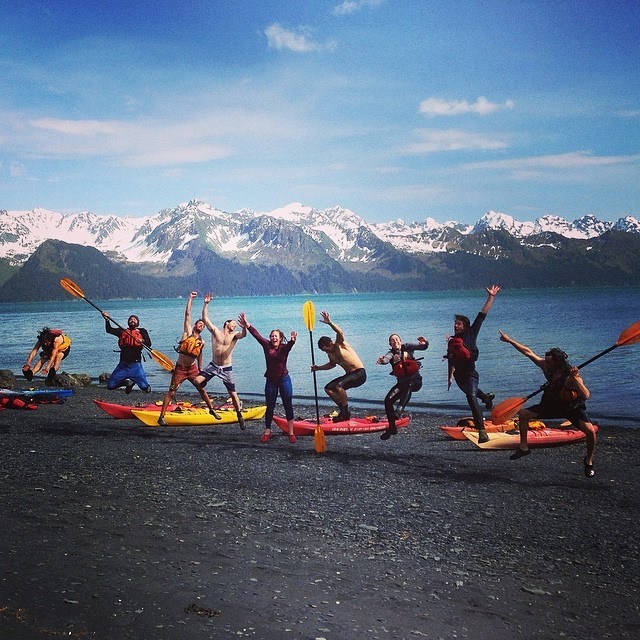 We are absolutely “KRAZY” about kayaking on The Kenai, Alaska’s Playground. Being out on open water with the wind in your hair, the sun beaming down, mountains in the distance, the booming sound of glaciers calving, and wildlife to view from land to sea. Needless to say, a kayaking addiction is easy to come by and hard to shake. Bear Glacier. 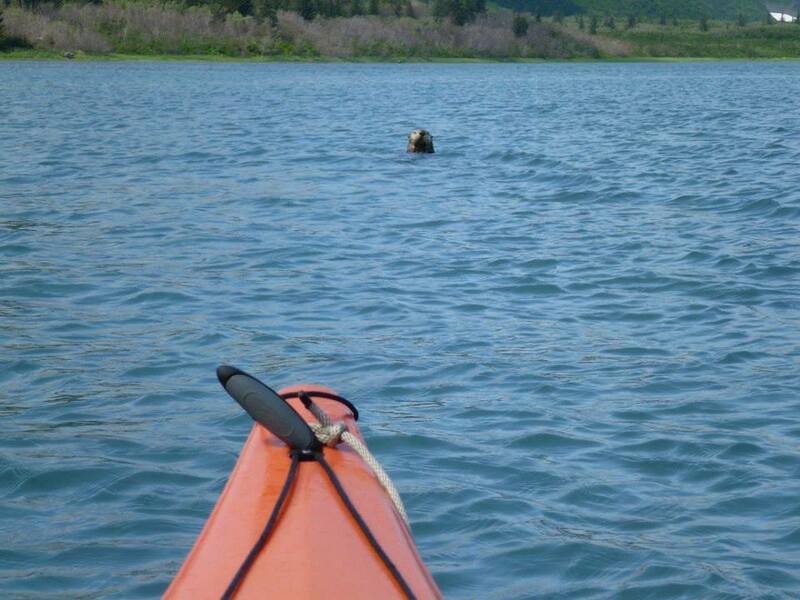 Photo courtesy of Sunny Cove Sea Kayaking in Seward, AK. 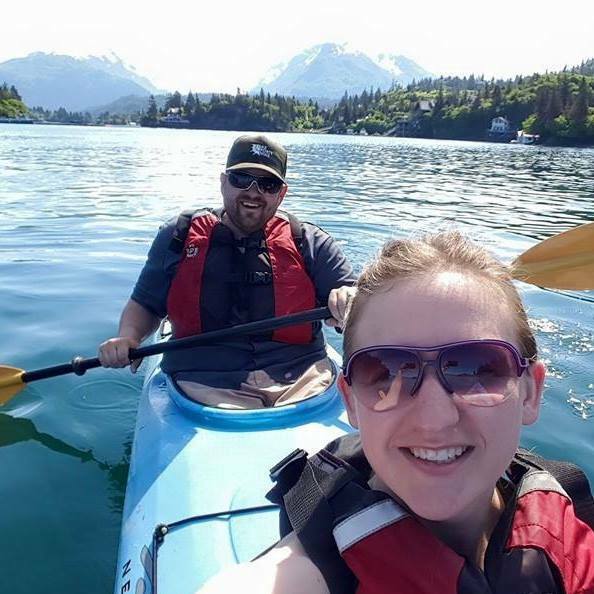 From Kachemak Bay State Park in Homer, Prince William Sound, Humpy Cove, to Fox Island, Resurrection Bay and the Kenai Fjords National Park in Seward… we can’t get enough of the fun and adventurous outdoor activity! 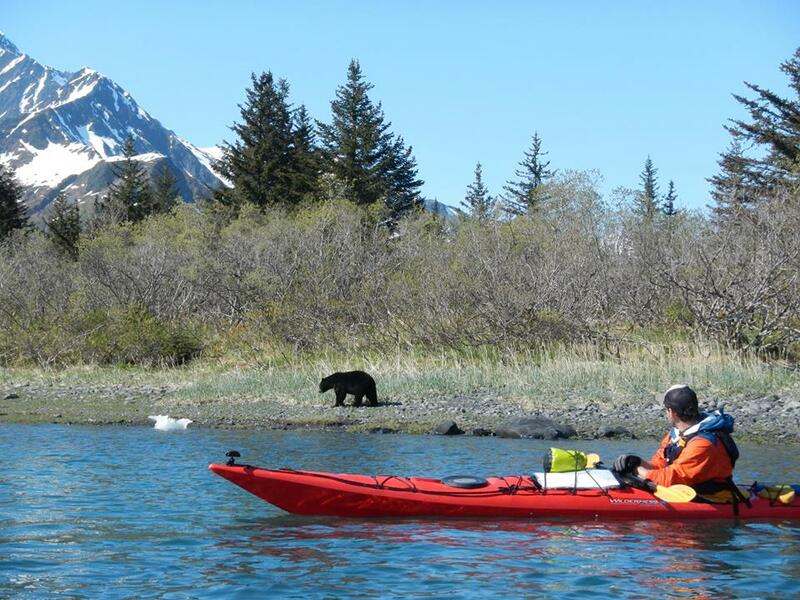 Photo from Kayak Adventures Worldwide in Seward, AK. 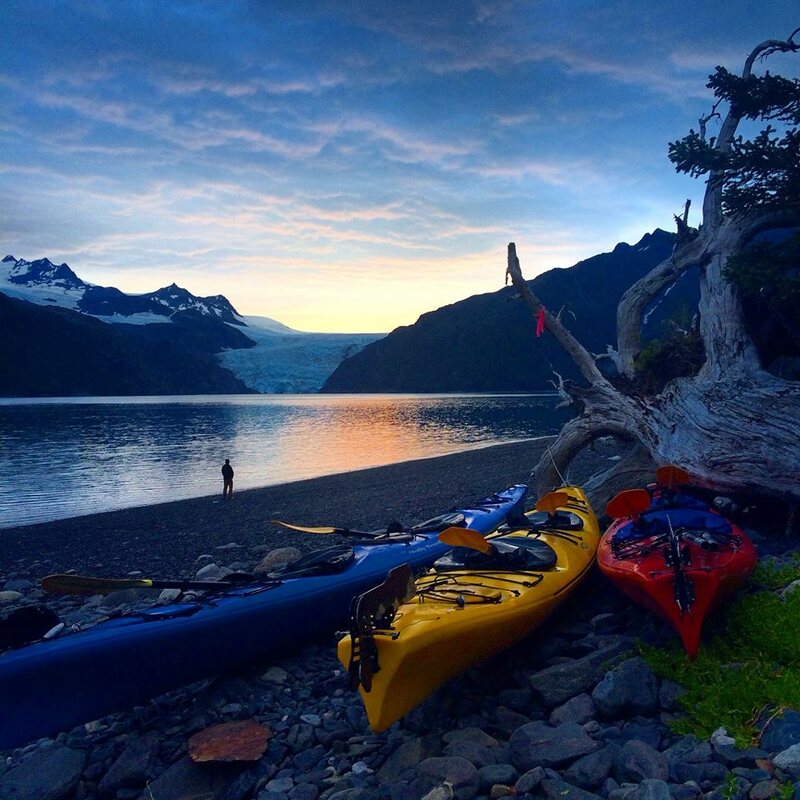 There are lots and lots of incredible places to go kayaking on Alaska’s Playground, but we would like to show you a few lodges and guide outfits that are top-notch and come highly recommended. KPTMC’s Member Services Director, Keith Baxter with his beautiful wife Desiree enjoying Halibut Cove. 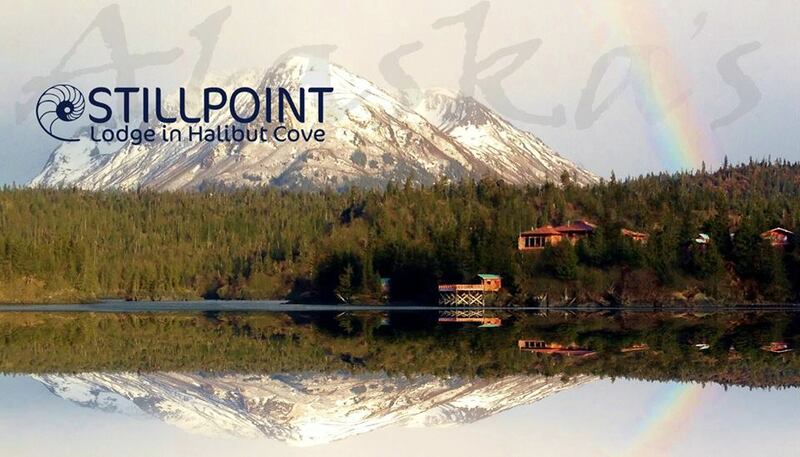 Up first is Stillpoint Lodge across the bay from Homer, Alaska in the village of Halibut Cove. A short boat ride or float plane flight from Homer, and easily accessible from the lower 48, you’ll find a magnificent lodge nestled on the edge of the wilderness. Whether for a vacation, wedding, retreat, workshop, or a special family event, Stillpoint Lodge makes it easy to have the getaway of your dreams. In addition to being an incredible secluded getaway location, Stillpoint Lodge offers some of the most epic kayaking adventures that you will ever come by. 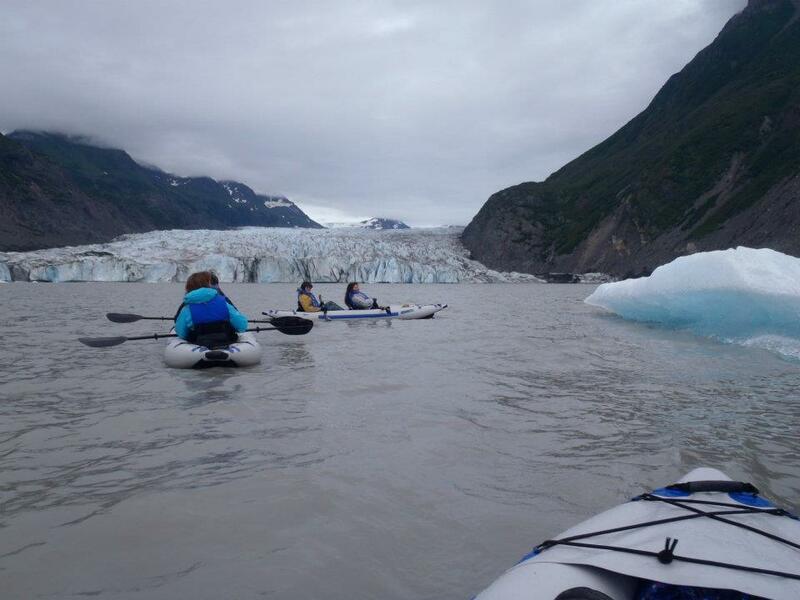 You can embark on a guided kayaking tour in Kachemak Bay State Park including kayaking at the Glacier Lake. 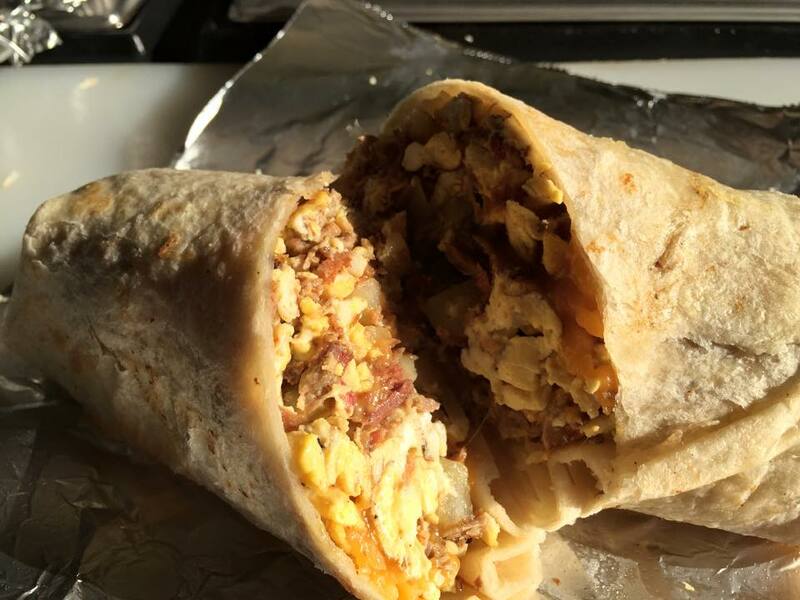 Caution: your breath will be taken away. It is stunning! Homer Ocean Charters in Homer, AK has so much to offer. They have been offering premier fishing charters for halibut and salmon since 1979. 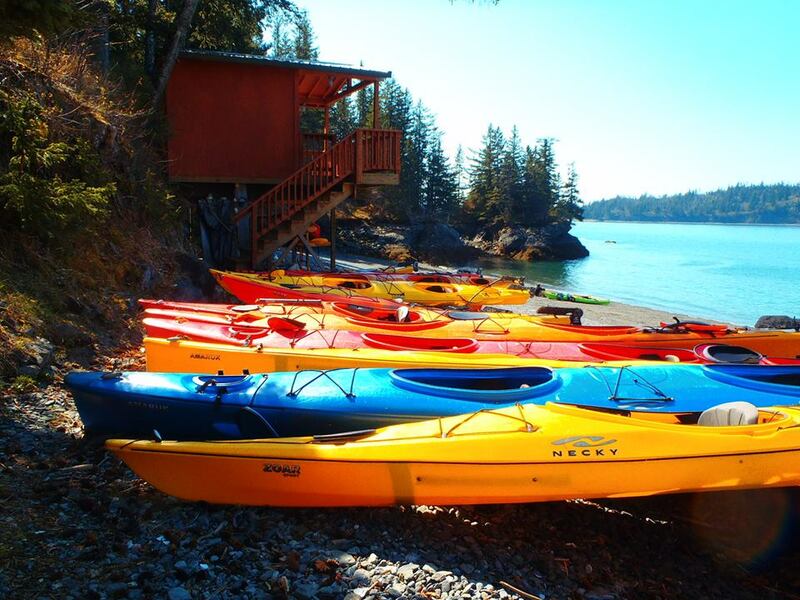 Homer is the premier destination for sea kayaking in Kachemak Bay. You are totally surrounded by picturesque mountain peaks, remote fjords and abundant wildlife. 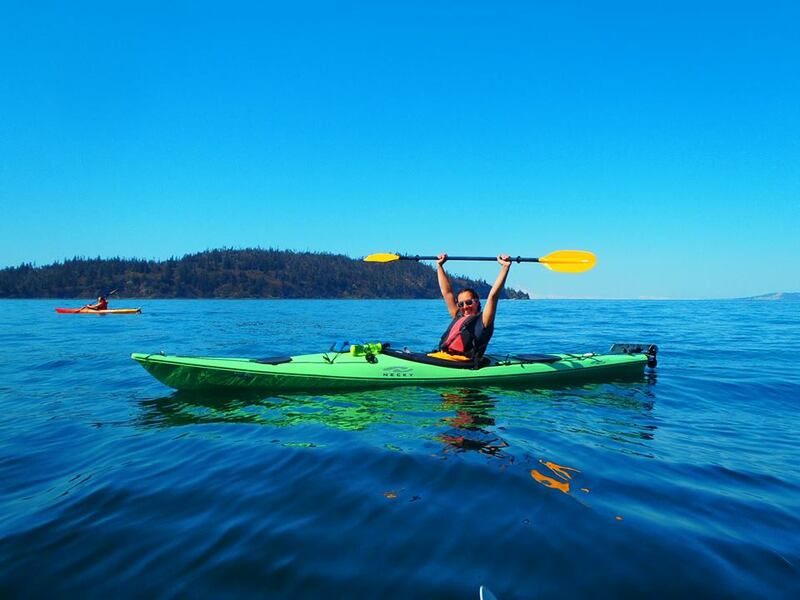 Homer Ocean Charters offers guided day and multi day kayaking trips for beginning and experienced sea kayakers. 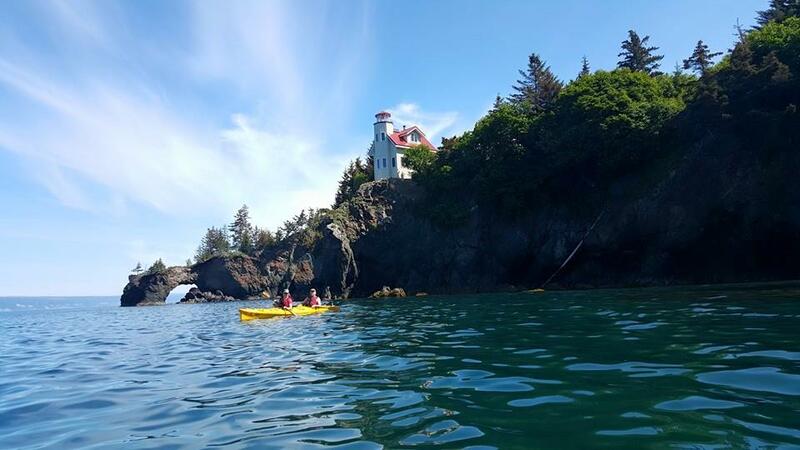 Paddling among the sea otters, porpoises and even whales at times, including tide pooling, and learning about the local area adds to your exceptional experience. Their guides are experienced, knowledgeable, and helpful. 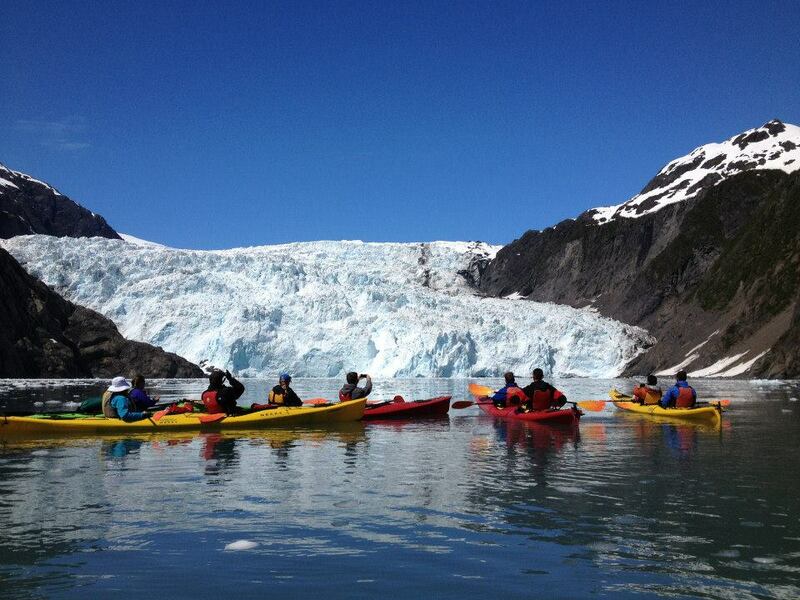 Many paddlers have stated that kayaking with Homer Ocean Charters has been the highlight of their Alaskan vacation. They use single and double person necky kayaks that are very stable for beginners while providing the adventure the more experienced paddler is looking for. 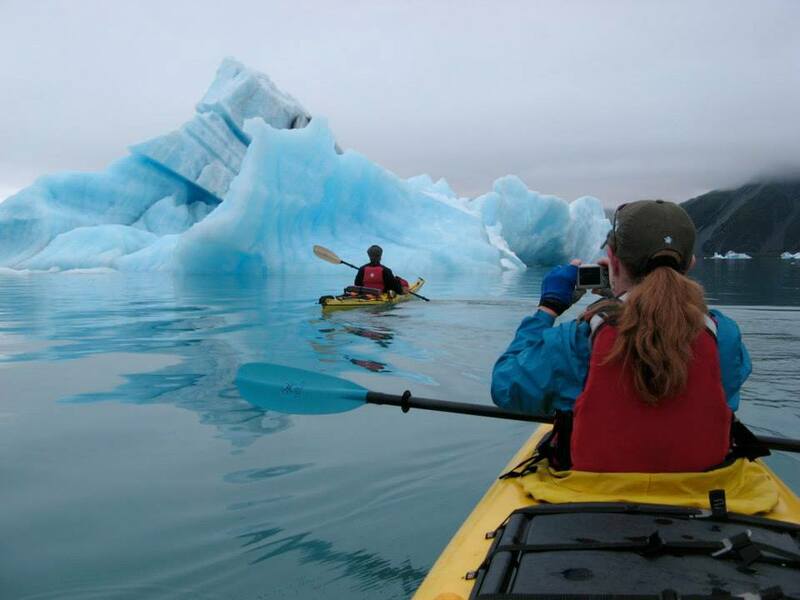 Kayak Adventures Worldwide in Seward, Alaska is one of the coolest kayaking outfits around. If you’re looking for “local vibe, local access, awesome people and an excellent adventure” this is most definitely the place for you. 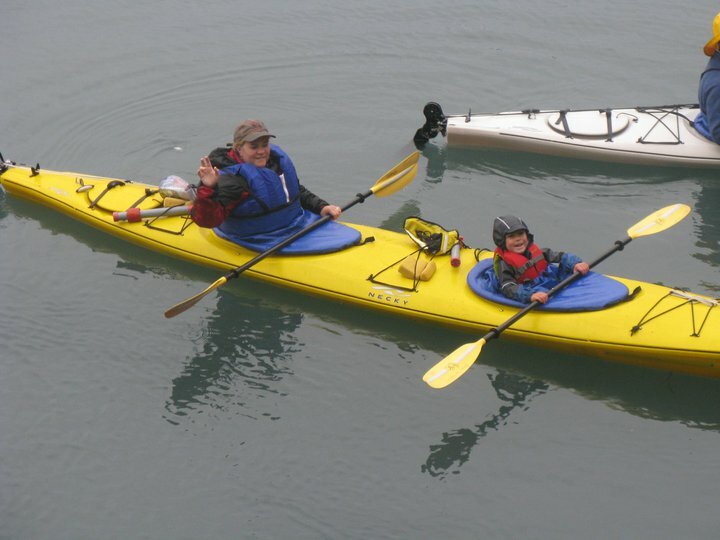 Kayak Adventures Worldwide is a small shop based in Seward, Alaska offering environmentally friendly and educationally based sea kayaking trips. You don’t need any experience to join their trips – just an adventurous spirit and a desire to learn and explore the great Alaskan wilderness. Check out more incredible photos by visiting their Facebook page Kayak Adventures Worldwide. Oh and we must add… Kayak Adventures Worldwide has succeeded in proving to us that sunsets on a kayaking adventure have a way of appearing much more magical than your average everyday sunset. It almost looks like the colors of the sunset are reflecting off of the kayaks. Simply incredible! 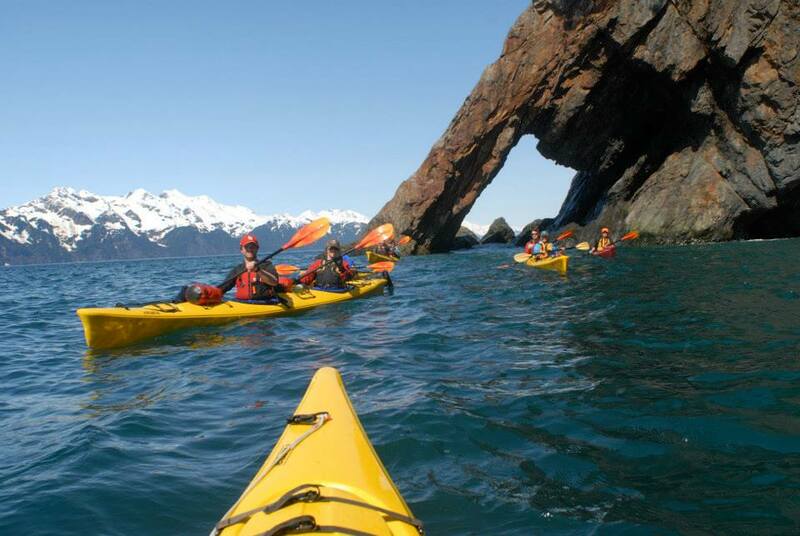 In the same “neck of the woods” is another incredible guide outfit; Sunny Cove Sea Kayaking in Seward, Alaska. 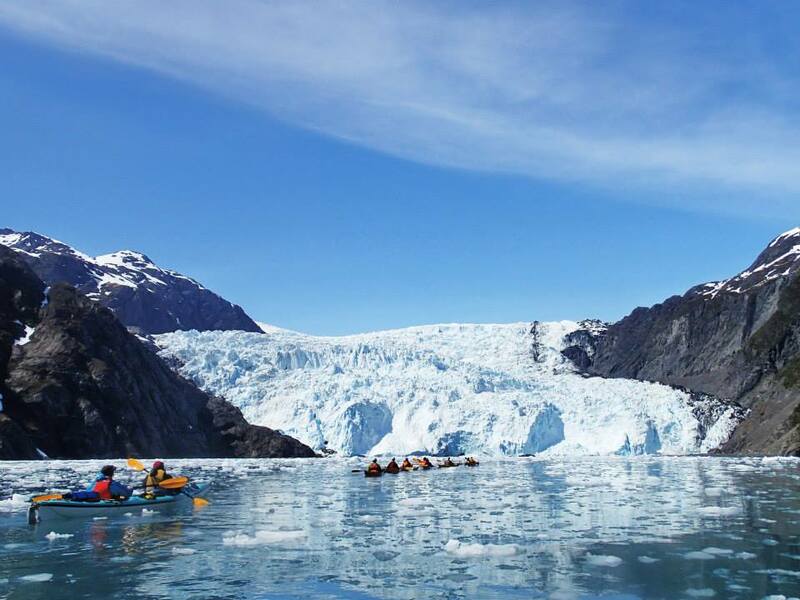 Imagine sea kayaking in a place of turquoise blue waters teeming with whales and puffins, tidewater and alpine glaciers, protected coves and rugged cliffs under glorious skies. These visions become reality while sea kayaking in Kenai Fjords National Park and Resurrection Bay with Sunny Cove Sea Kayaking. 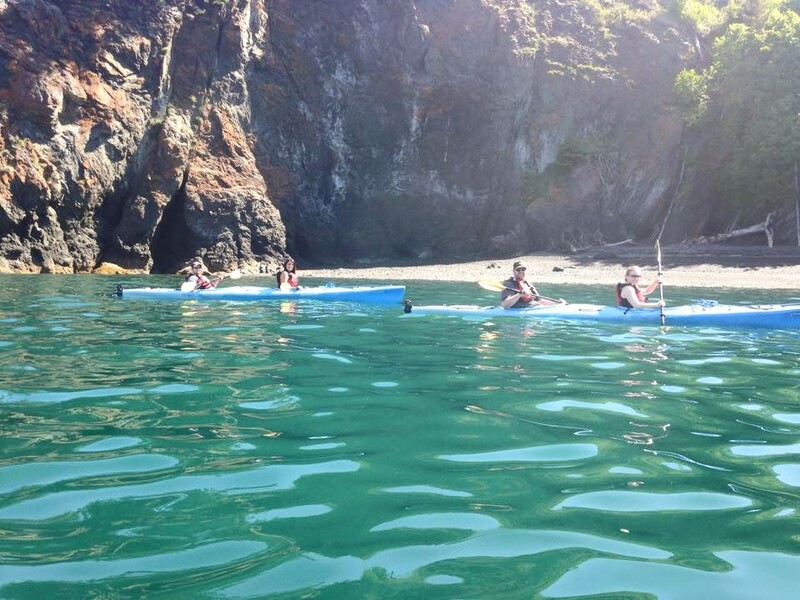 Sea otters casually watch you as they feed on sea urchins and mollusks; seals follow you curiously as you kayak in silence; pods of orcas glide through the waters as they search for salmon… and it’s all waiting for you at Sunny Cove Sea Kayaking. Checking out the lush and mountainous Fox Island in Resurrection Bay is always an incredible adventure with Sunny Cove Sea Kayaking. Orca Island Cabins is next up on our list. Located in Humpy Cove in Resurrection Bay outside of Seward, this fabulous place offers unique yurt accommodations on a private island. 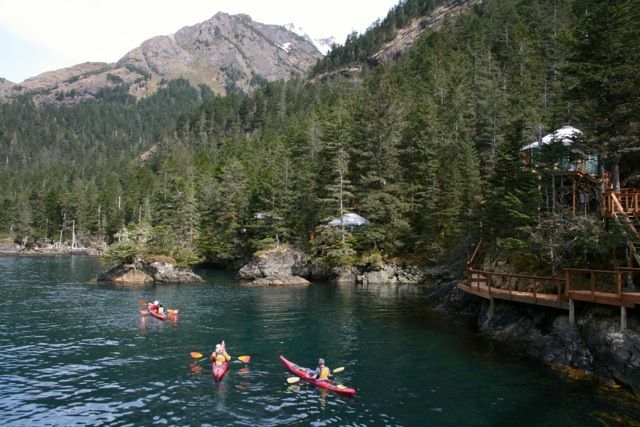 Enjoy the best in Alaska with whale watching, incredible kayaking, fishing, hiking or just sitting back and relaxing. We did a full blog on Orca Island Cabins last summer. 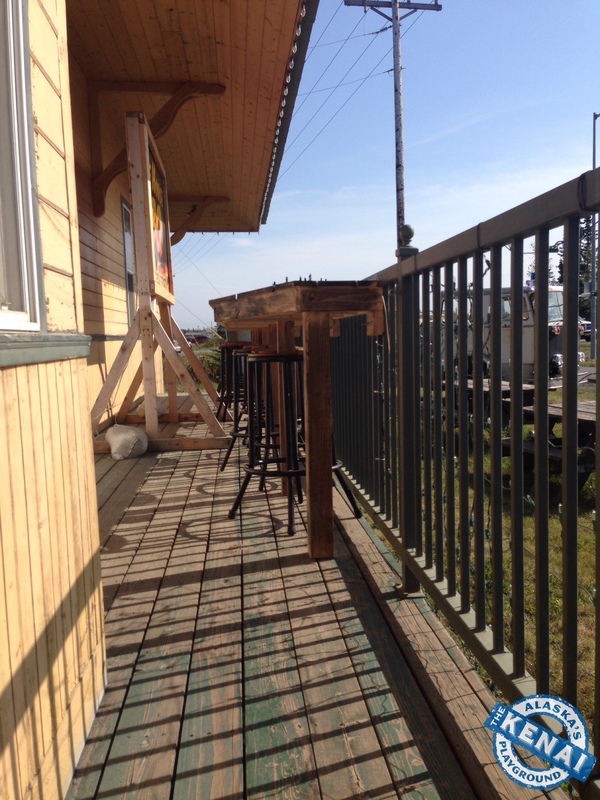 To read more about this special place, check out the full blog on Orca Island Cabins Orca Island Cabins. Whether you are interested in a personalized day cruise, including glaciers, whales and wildlife viewing, need a trip to a public cabin in Prince William Sound, or an expedition using our kayak transport, Lazy Otter Charters Inc. would love to help you with your Prince William Sound adventure. They are even now offering year-round winter tours of the sound! 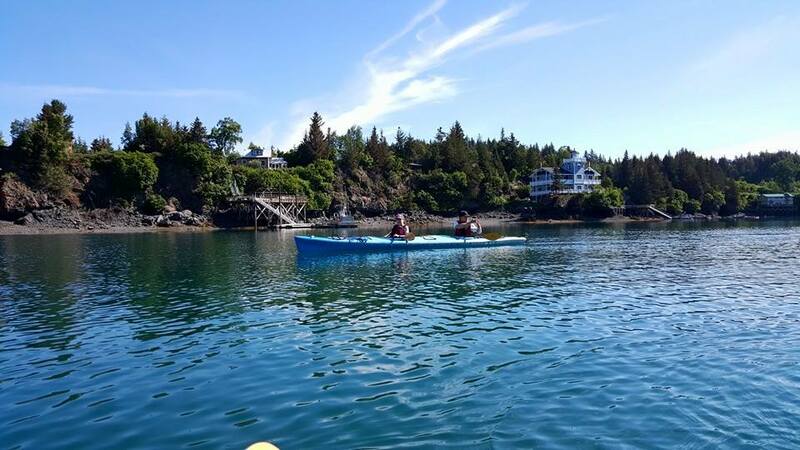 If you are a kayak owner and are looking for a great location to go out on your own adventure, please don’t hesitate to give us a call at 907-262-5229 or visit us online HERE. Photo courtesy of Keith Baxter, Member Services Director at KPTMC. Are you addicted yet? If you aren’t… hurry and call one of these great places and succumb to the adventure that is sure to steal your heart and never let it go. Photo courtesy of Desiree Baxter, Realtor at Jack White Real Estate in Soldotna. Get out and enjoy the sunshine this weekend… and all summer long for that matter. Happy paddling, friends! Photo courtesy of Denai Keene, Realtor with Jack White Real Estate of Soldotna. On The Kenai, Alaska’s Playground we live in paradise 365 days a year. But the “9 to 5” part of paradise sometimes requires a happy injection of good, hearty stick-to-your-ribs food. Because lets face it, sometimes its just A-OKAY to eat your way to happiness. Especially on a Friday! So, whats on the menu? 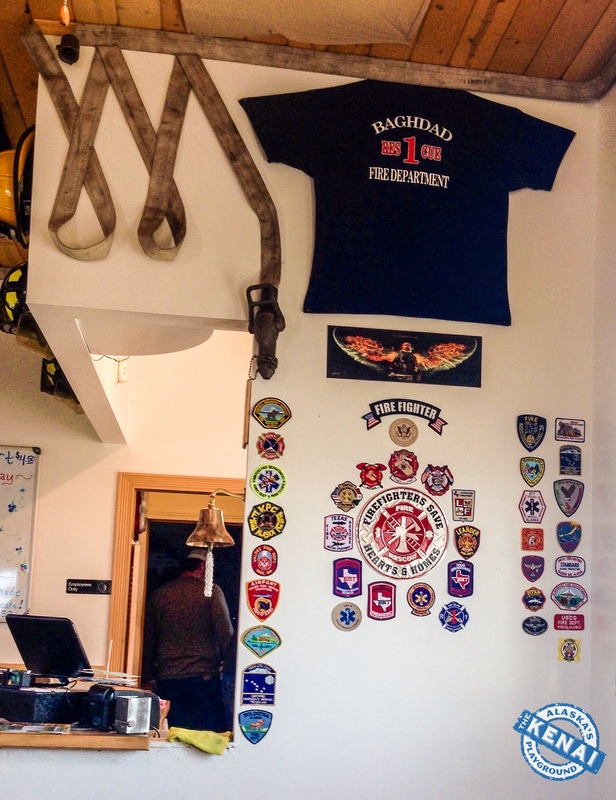 Firehouse BBQ in Soldotna, AK! 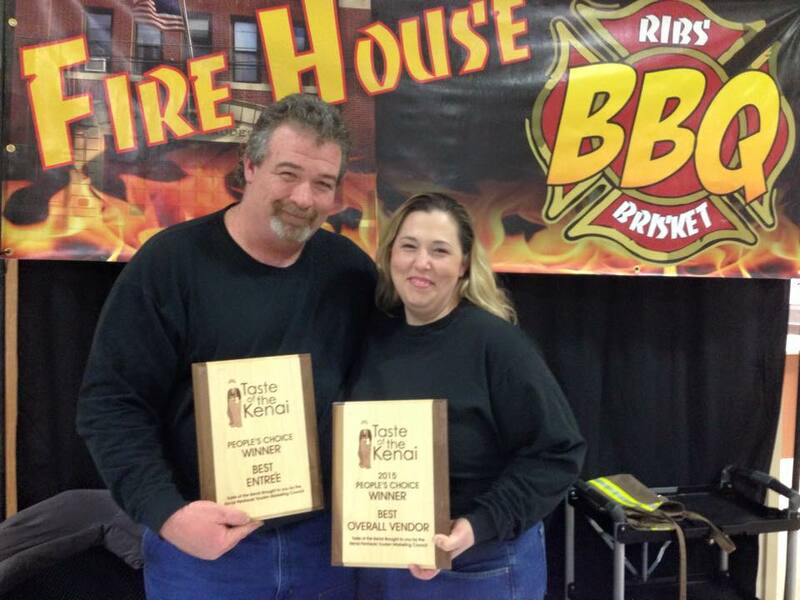 You might have heard of this awesome place before, they did win both the People’s Choice “Best Entree” award and the People’s Choice “Best Overall Vendor” award at this years Taste of the Kenai. That’s right, BOTH awards. Like we said, this place is pretty awesome. And the owners? Talk about some of the funniest and most kind-hearted people that you will ever come by. 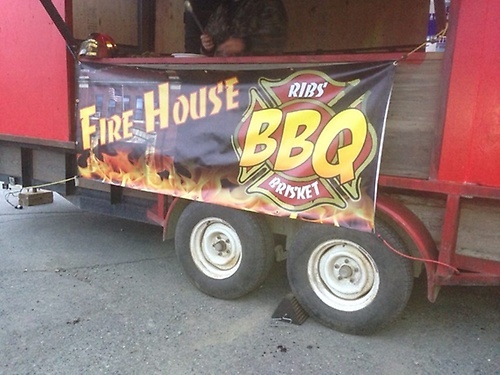 Last summer, Firehouse BBQ started as food truck just down the road from the Kenai Peninsula Tourism Marketing Council in Soldotna. 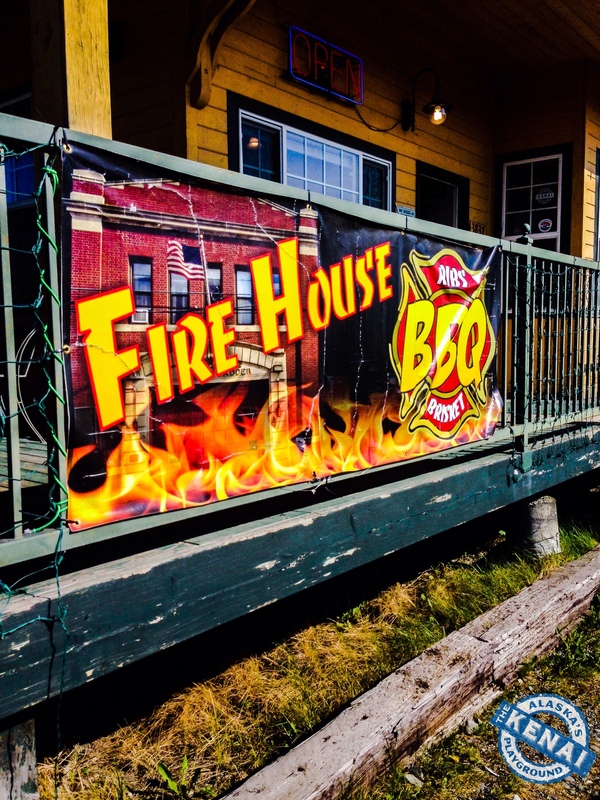 We were thrilled when Firehouse BBQ opened up a permanent location off of K-Beach Road in Soldotna. After lots of hard work and a total remodel, this place looks sharp! We love the patriotism shown throughout this cozy picnic-style dining atmosphere. 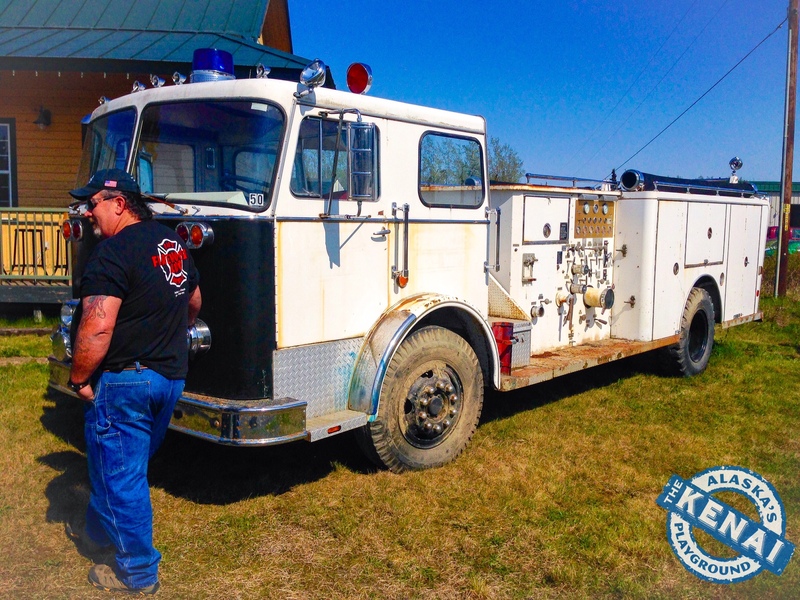 The owners and employees truly care for the hardworking men and women serving and protecting our great community. 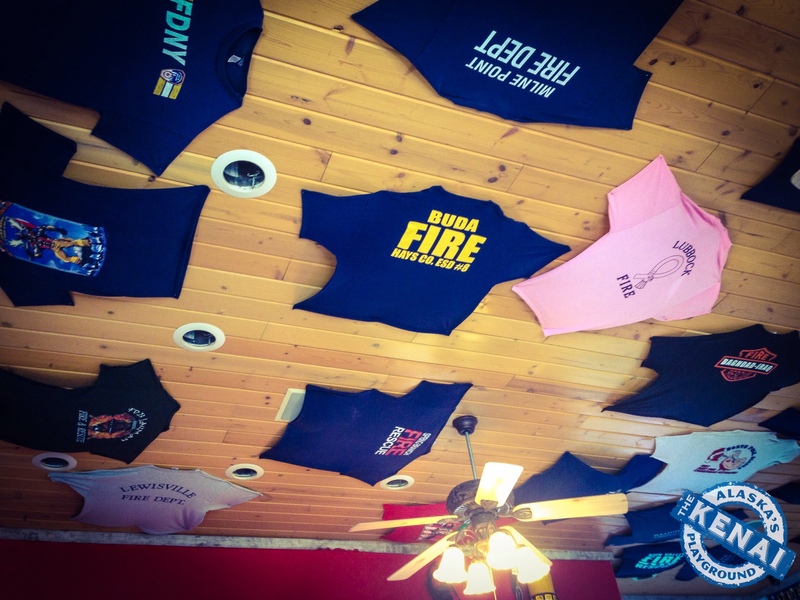 Another cool decorative element to Firehouse BBQ is all of these groovy shirts on the ceiling with different Fire Departments from across Alaska and the “lower 48.” Many communities coming together in one building over excellent BBQ and desserts. Our kind of place for sure! And for those long summer days with warm weather and nearly 24 hours of daylight, ample outdoor seating is always appreciated! The deck bar-style seating area was just finished and there are also several picnic tables on the lawn out front (so you never have to worry about not having a place to sit when the parking lot is full). 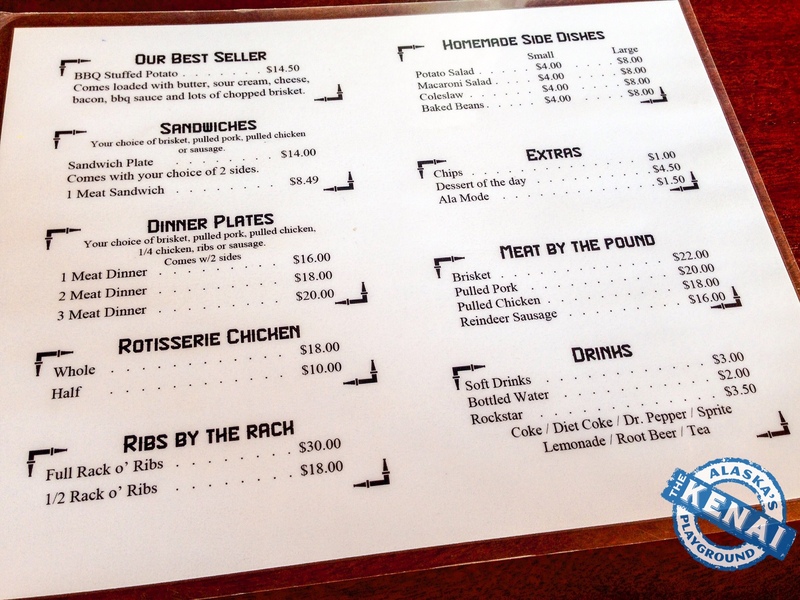 Now onto the (really) good stuff; the menu. Read, drool, be mesmerized. 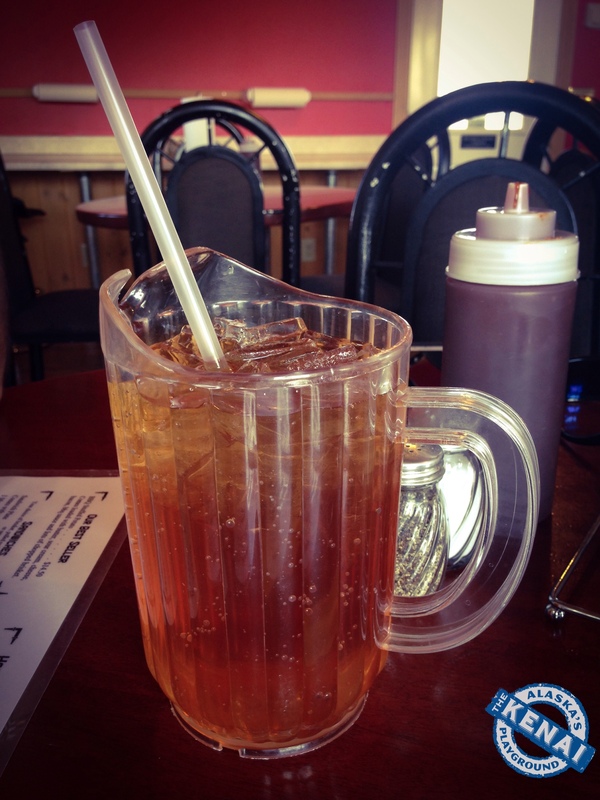 And out of pure joy over the mini-pitchers, we decided to order a sweet tea as well. What were we thinking? 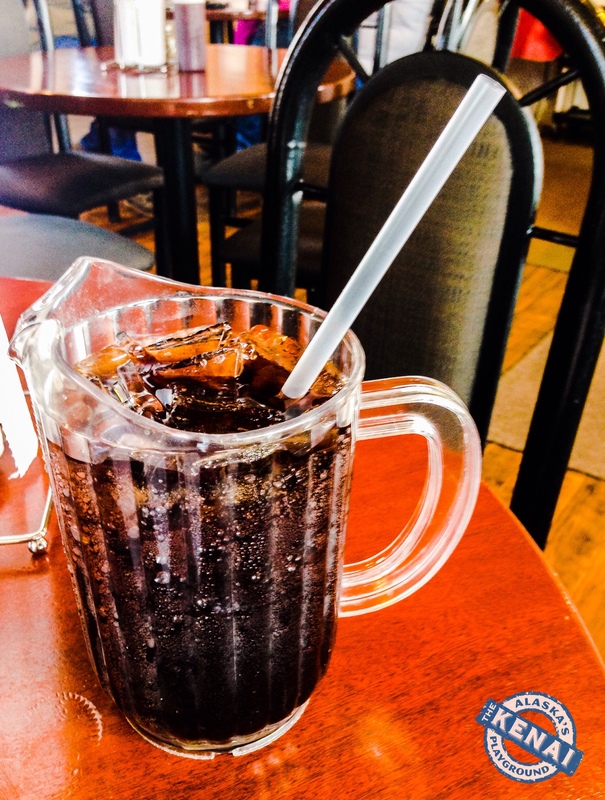 Sweet tea goes PERFECT with good southern BBQ. And this particular tea tasted absolutely incredible! 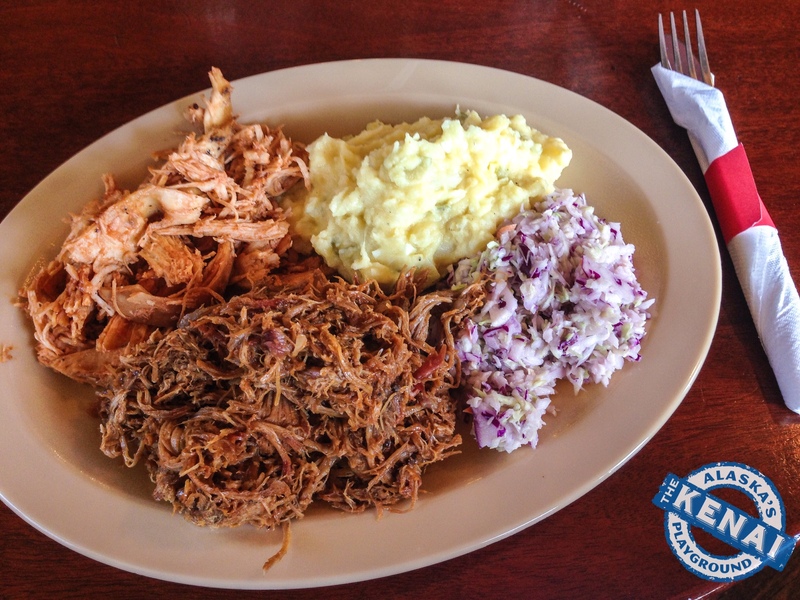 First up was pulled pork, pulled chicken, potato salad and coleslaw. Ah-maz-ing. No words. Just the sound of “mmmmm” 😉 Coleslaw is always questionable from one restaurant to the next. But this coleslaw is SO good. Perfectly creamy, moistened and seasoned. 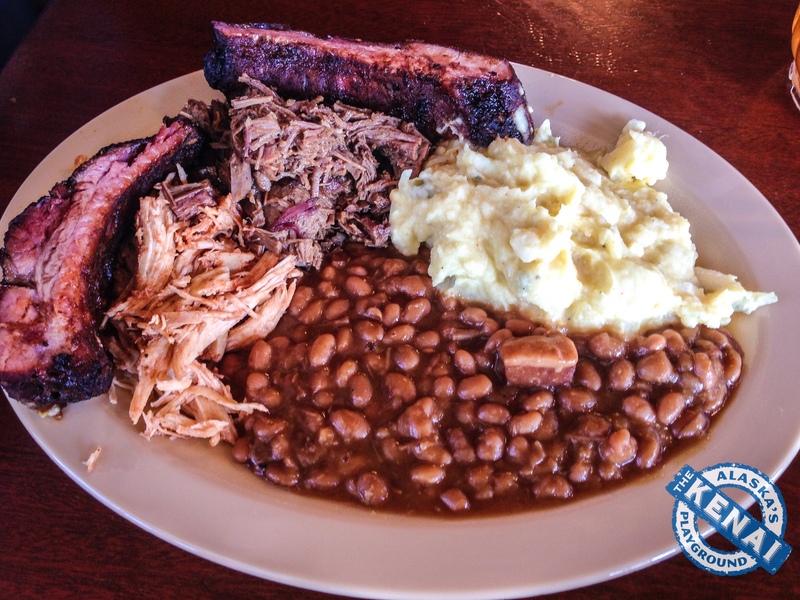 Next up was pulled chicken, brisket, and ribs with baked beans and potato salad. Again, no words. Just so incredibly good. Minimal conversation was being had at the table. 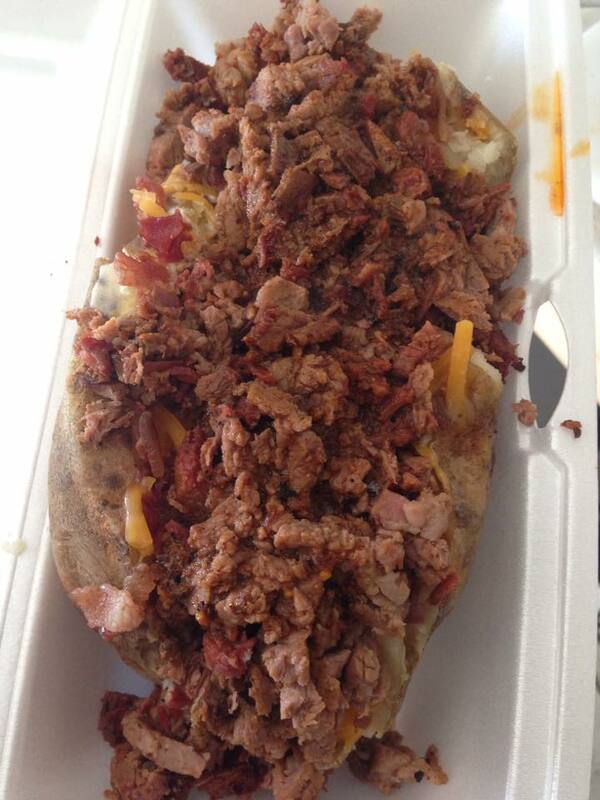 For the road we just had to try one of the BBQ Stuffed Potato’s listed on the menu under “Our Best Seller.” Comes loaded with butter, sour cream, cheese, bacon, bbq sauce and lots of chopped brisket. We didn’t get a picture because we were in a bit of a food coma, but it looks a little something this this… (Note: average weight it 2lbs). 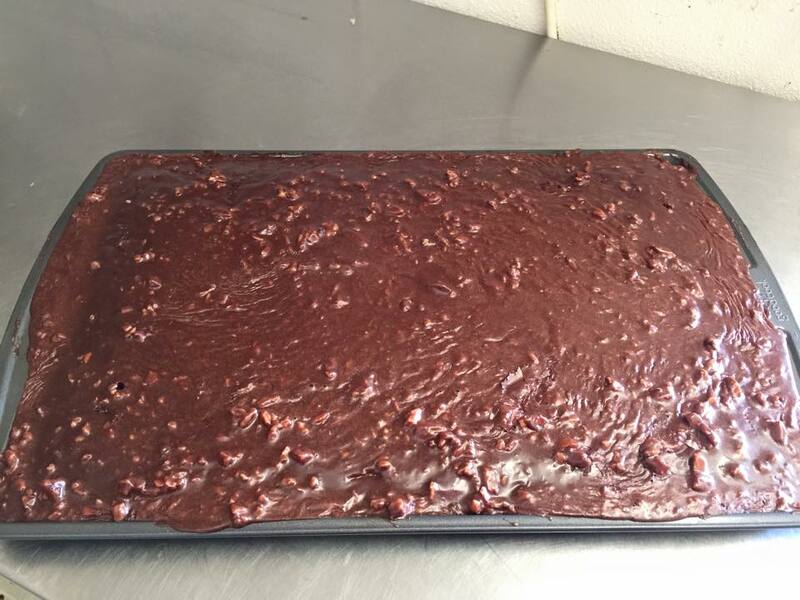 We were way too stuffed to indulge in dessert but word on the street is that Firehouse BBQ has some of the most mouthwatering homemade desserts around. 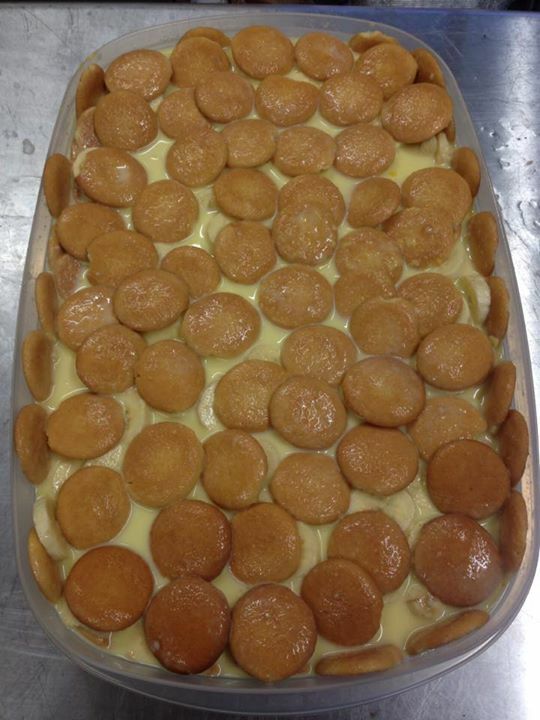 Like this “world famous” banana bread pudding. Or this Coca Cola cake. Holy chocolate lovers paradise. YUM! 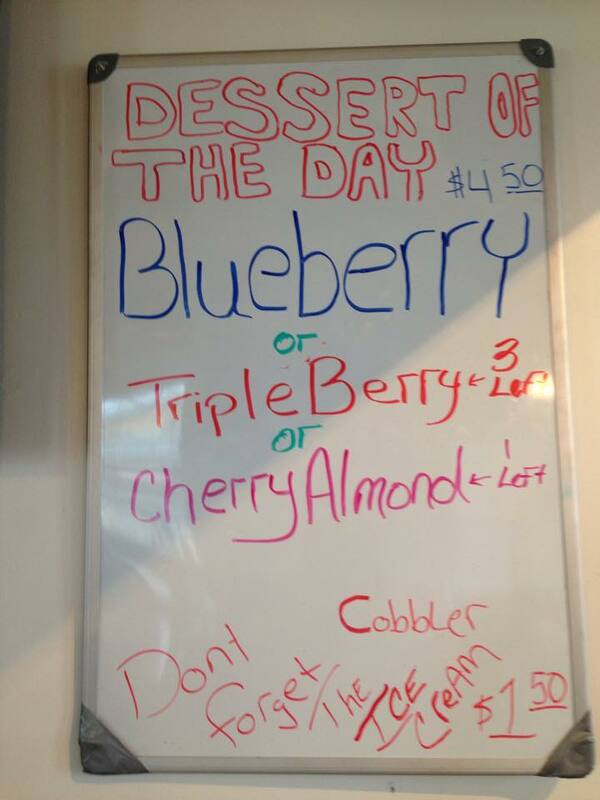 And tons of fresh homemade cobblers and homemade vanilla ice cream rotated daily. 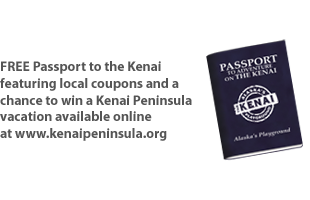 When most people think of The Kenai, Alaska’s Playground they think… fishing, hiking, kayaking, mountains, glaciers, wildlife, etc. 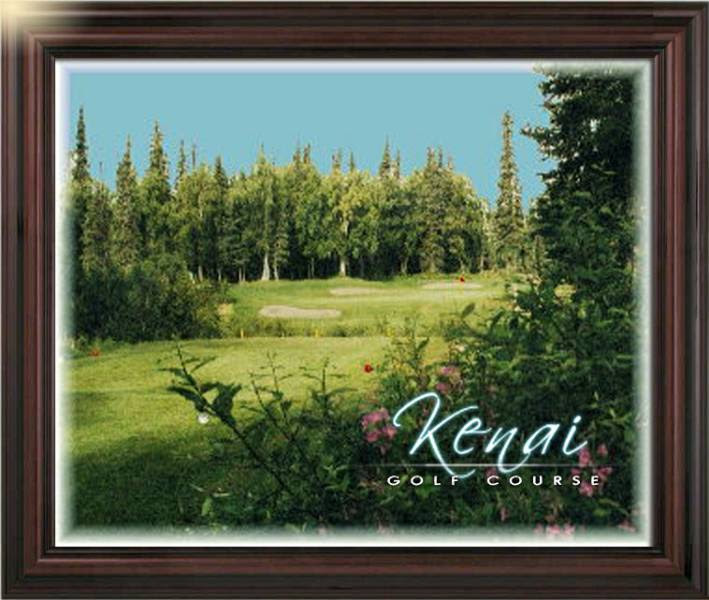 But what many don’t know is that the Kenai Peninsula is actually a beautiful golfing destination. 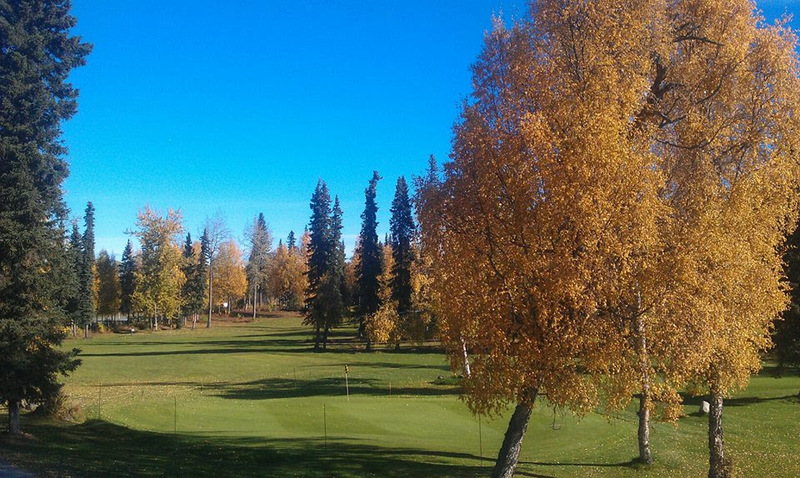 Photo from Birch Ridge Golf Course in Soldotna, AK. Although we are limited on our total number of golf courses, the ones we do have are absolutely stunning. Check out those amazing mountain views! 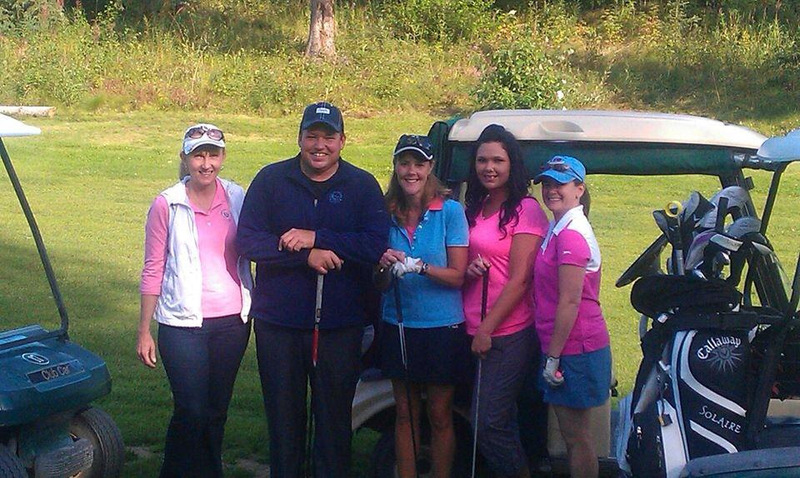 Photo from Kenai Golf Course in Kenai, AK. 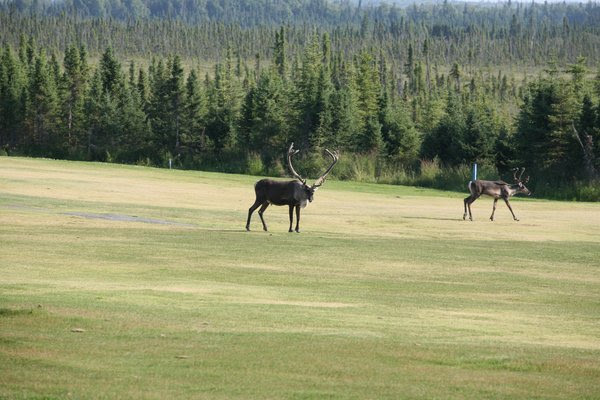 If you are visiting the Central Peninsula and pass through Soldotna, “Alaska’s Kenai River City” you must check out Birch Ridge Golf Course. This is a uniquely challenging golf course with gorgeous views. Birch Ridge is a full length nine hole golf course with separate tee boxes for the “front” and “back” nines. When stretched out to 3,200 yards, the folks at Birch Ridge Golf Course say that you won’t find a more challenging golfing experience anywhere. 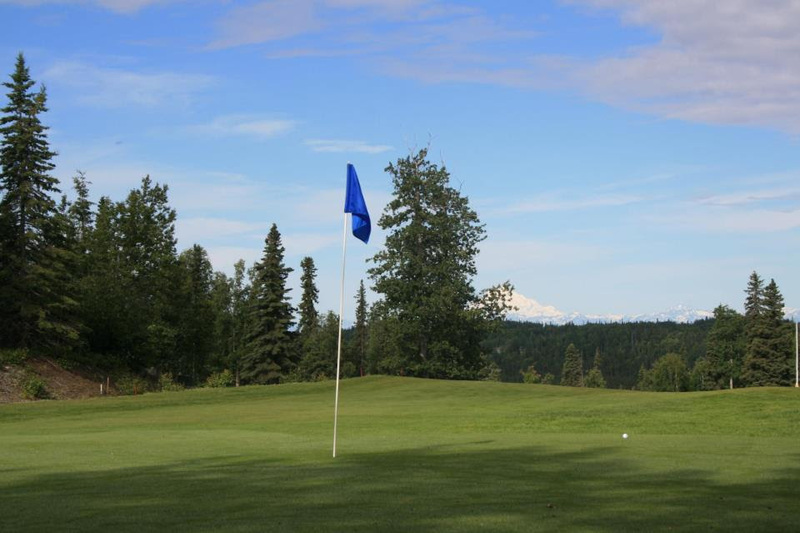 Their greens are wonderfully contoured and consistently rated as the best greens in Alaska by state club professionals. They offer rental cottages and cabins, a delicious restaurant and a stocked pro shop. 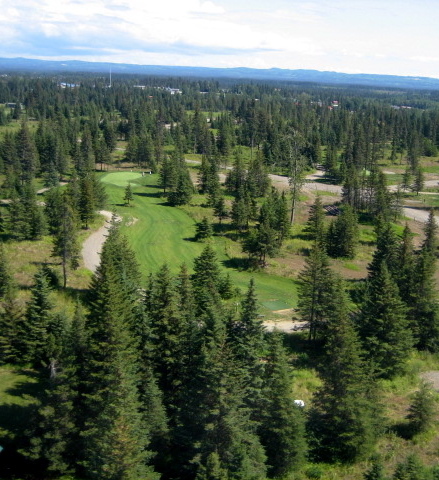 The beautiful Kenai Golf Course in the town of Kenai, AK is the only full-service 18 hole course on the Kenai Peninsula. Chances are you’ll catch a glimpse of a sandhill crane family, a mama moose with twins, or a pair of bald eagles. Enjoy our driving range and other practice facilities. Check out our clinic schedule or call for private lessons. The clubhouse offers golf equipment and merchandise, and a snack bar for speedy lunches or a leisurely snack. We have club rentals and push cart and power cart rentals available. 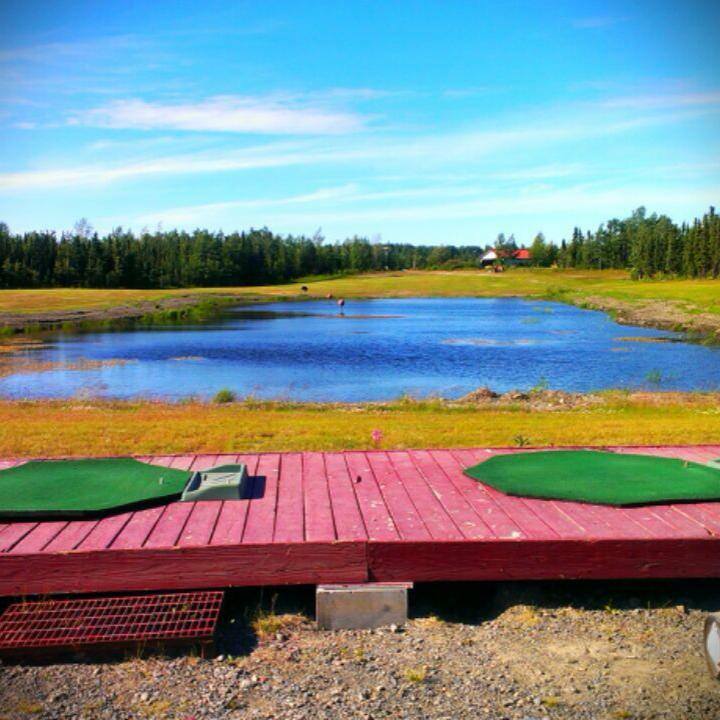 Another course in Soldotna, AK that offers a water driving range and 9 holes of golf on a Par 37 course is Bird Homestead Golf Course located off Funny River Road. Photo courtesy of Bird Homestead Golf Course Facebook Page. 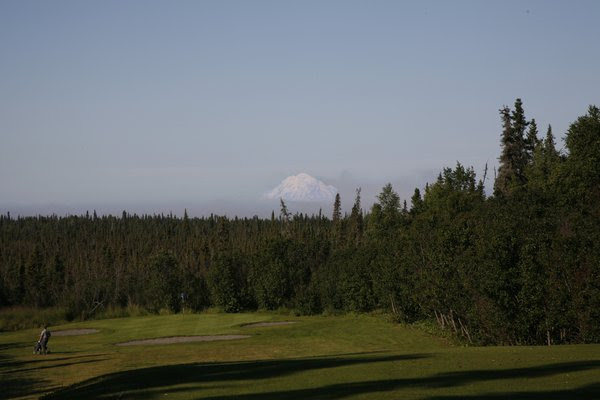 In the beautiful town of Anchor Point, AK you will find the Fireweed Meadows Golf Course. This was the first golf course in the State of Alaska to feature new technology synthetic turf on all tee boxes, greens and fringe. 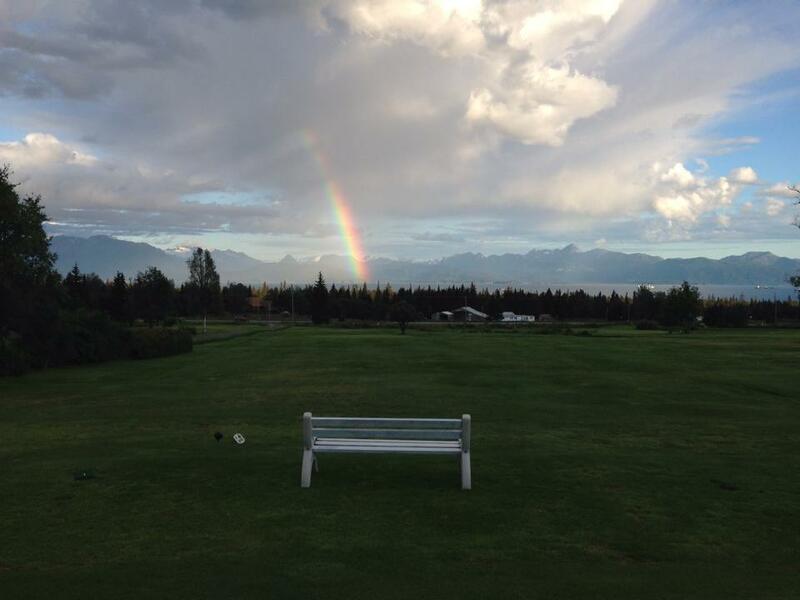 Photo courtesy of Fireweed Meadows Golf Course. The town of Homer, AK features the Homer Golf Course (or “The Tips Golf Course”) which is a 9 hole, par 3 course with impeccable views. This historic golf course was a labor of love that has been established since 1982. Photo courtesy of Homer Golf Course Facebook page. Alaskan wildlife–including moose, caribou, eagles, ducks, sandhill cranes, coyotes, wolves and an occasional bear may be seen around the edges. 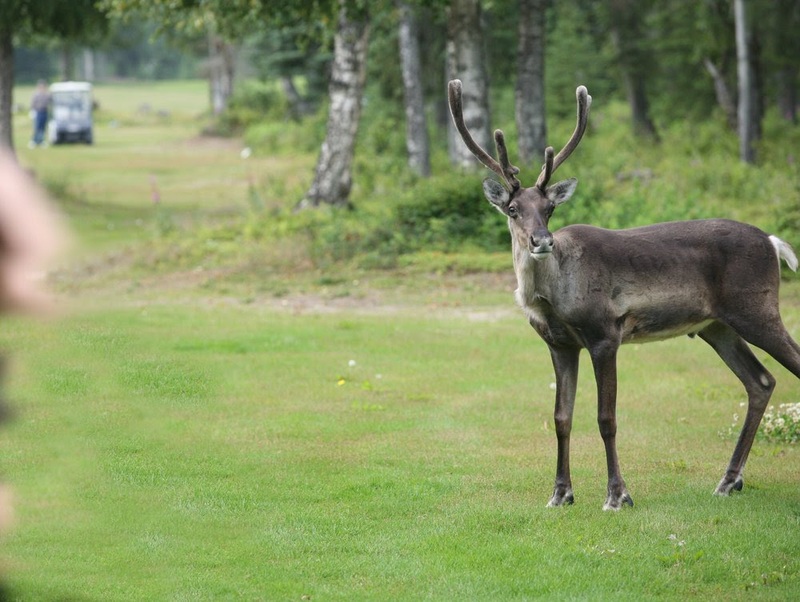 Two Caribou playing a round. Photo at the Kenai Golf Course in Kenai, AK. 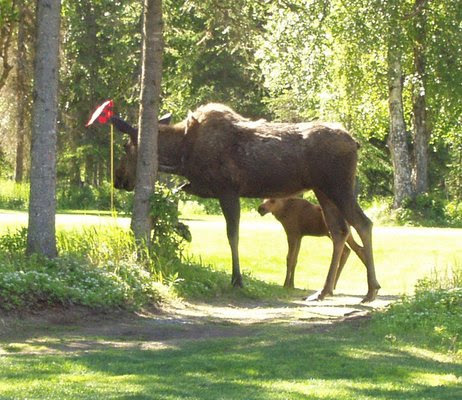 And be advised that you might roll up on a mama moose and her young snacking on the golf cart trail. So always drive slowly and use extra caution. Mama Moose & Baby Moose Snacking on the trail. Photo at the Kenai Golf Course. Up Close & Personal with a young caribou. Photo at the Kenai Golf Course. 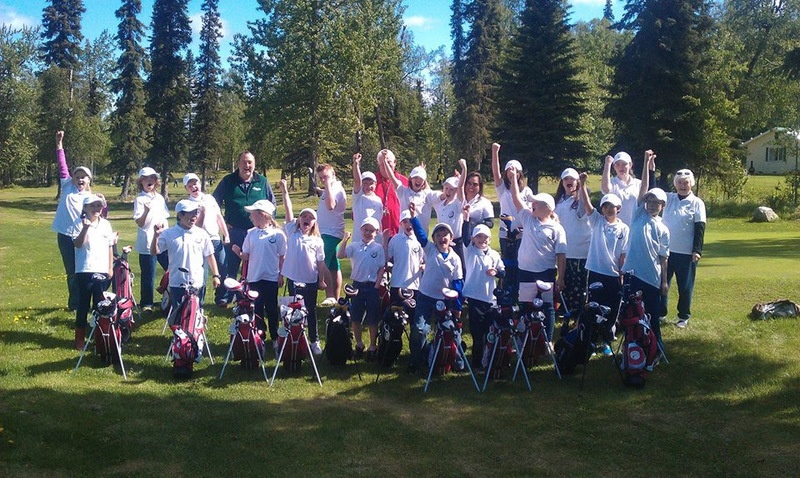 The Birch Ridge Golf Course and the Kenai Golf Course both also offer excellent women’s and men’s only clinics for those looking to learn the game of golf or brush up on their skills and learn a few new pointers. Photo at the Kenai Golf Course. And of course we can’t forget to mention that there is always something fun for the kiddos! 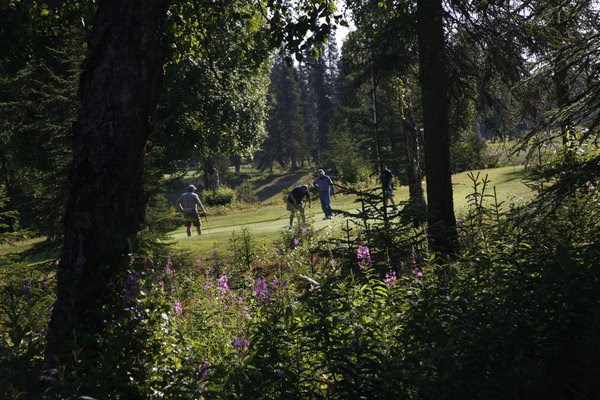 If you are visiting The Kenai, Alaska’s Playground this summer be sure to put a round of golf on your to-do list. Or maybe make that a round of golf every day? 😉 Hey, while the weather is beautiful and we have nearly 24/7 daylight, why not? Be sure to be on the lookout for the beautiful fireweed while you’re at it. Bright pink/purple and hard to miss! Photo at the Kenai Golf Course in Kenai, AK.